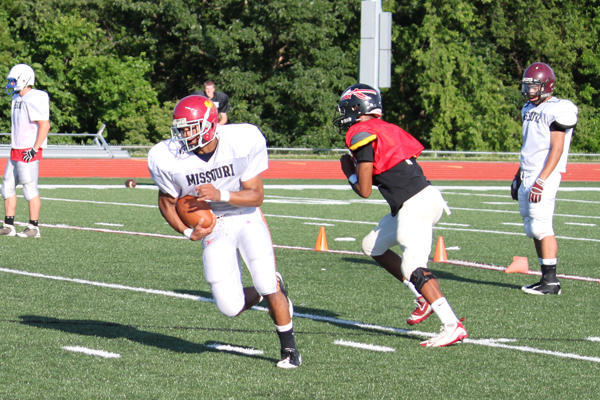 The first week of practice is in the books for the Missouri All-Stars and the team is coming together. With more than 40 players from all around the Missouri side of the metro quickly learning how to play together these first five practices were key to whether Missouri will be ready to take on Kansas when they meet 7 p.m. Thursday at Shawnee Mission North High School. The first few days of practice were some basics and 7-on-7 drills but the last few have been more physical with full pads. Raytown South head coach David Allie who leads the Missouri squad said even though they weren’t supposed to be hitting the first day the competition level got pretty high. “They worked hard,” Allie said. “It was high energy, high enthusiasm. We were not supposed to be popping but there was some popping in 7-on-7 seven. There were a few hits and some tackles that shouldn’t have been. The teamwork is important but one player who has spent a lot of practice time by himself is Christian Brinser of Liberty. The kicker for the Missouri All-Stars doesn’t get into the mix much and spent a lot of time working on his kickoffs and punting on the sidelines. Even though the former Blue Jay does a lot of his work by himself, he has enjoyed his time on the all-star team getting to know the other players. The all-star game is a good experience for Brinser. He is getting ready to take his skills to the University of Missouri as a preferred walk-on where he will attempt to work his way into the Tigers lineup. The Missouri All-stars will continue practice this week at Raytown South getting ready for Thursday’s game at Shawnee Mission North High School.